For The Kids! They bring us together and give purpose to THON. 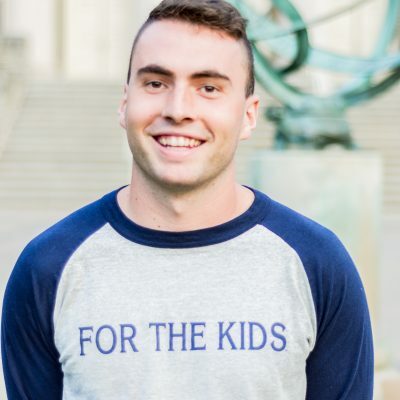 Without the amazing kids that we fight for I would not have found this organization that has become such a large part of my identity at Penn State. The leaders and friends that I look up to have helped to shape me into who I am today, and I hope to help others do the same this year! What are your main duties as the Hospitality Director for THON 2019? As the Hospitality Director I have 20 captains and 260 committee members that are my first priority. Giving the 20 Hospitality Captains the resources to lead their committee members will result in a successful THON experience on all fronts. In terms of tangible tasks it is Hospitality's responsibility to solicit food and drink donations for all THON events to fuel the families, dancers, and volunteers. This past THON I was standing in between the dancer meal tables during one of the busiest times of the weekend. The committee members on my committee were serving a dancer meal and the buzz of the BJC was something that you could both feel and see. I stood there for a second and took it all in, realizing this was what my committee members had worked the entire year for. Watching dancers perk up as they got their food was something that I won't forget. The panoramic view from between the dancer meal tables will always be one of the defining moments of THON for me. I was the chair of the Navy ROTC org called Operation Blue and Gold last year. We grew a lot as an organization and reached a new fundraising record with the awesome help of DonorDrive. This year I will be helping to transition the new chairs into their responsibilities. One of my major goals that I share with all of the other members on the executive committee is pushing THON forward in a more sustainable way. I am really excited to get to work on some new earth-friendly ideas so that kids can continue to enjoy our awesome planet for years to come!